Our judge was Nick Serratore. Nick was born and raised in Abington, PA. He graduated from the Hussian School of Art in Philadelphia and from Wilmington University. In the past decade he has had multiple solo exhibitions, participated in many charitable events, and won numerous awards for his pastel landscapes. 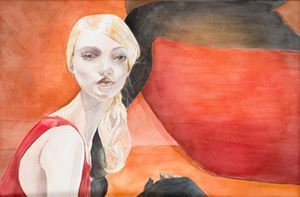 He recently won a 2012 Individual Artist Fellowship Grant from the Delaware Division of the Arts or emerging Delaware artist. His narrative pastel landscapes first capture the attention of the onlooker then draw the viewer inward seeking the message of the work. 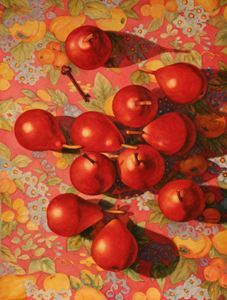 He is represented by Pennisula Gallery in Lewes, Delaware and is a member of the Pastel Society of America located in New York. Special thanks to Gail Zinar for coordinating the show and transporting paintings. And thanks to her hanging committee: Nancy Mysak, Gerry Gaskill, and Elizabeth Zinar. 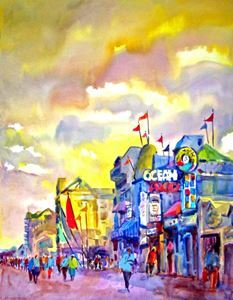 Below are the Award winners from the Ocean City Center for the Arts Exhibition held in April 2014. The artist was able to fill the painting with wonderful, loose brush strokes and color harmony, creating both excitement and energy. The scale of the buildings in relationship to the figures resulted in an interesting composition, having been rendered but not detailed. The filtered sunlight sets the mood and tone of the painting. This painting definitely captures a day in the life. The vertical format creates an expansive landscape. The figures, in relationship to one another, form an exciting circular composition only to be off-set by the boat which breaks the horizon leading the viewer to the top of the painting. 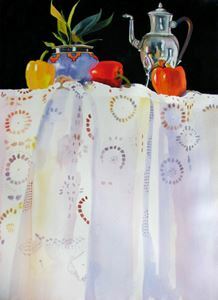 The pears and tablecloth in this painting are equally strong in color and definition, yet they do not distract from each other. The artist was able to capture “movement” with inanimate objects. One almost overlooks the key that is on the table which subtly guides the viewer in the direction of the pears. The rendering of light and shadow creates balance. The high horizon line for this still life makes an intriguing composition. The objects stand out against a harsh black background but rest on a pale soft surface. The long white drape of the fabric, with its subtle patterns dissolving towards the bottom of the painting, balances both background and foreground. The non-representational object in the background of this painting leads the viewer to focus attention on the gaze of the figure. The limited tonal palette and light brush work of the figure creates a serene mood and sets the tone of the piece. The artist is able to maintain a consistent fluid motion throughout this painting. The hard edges of the stems and flower petals seem to dance against the softness of the background.